Boat solar panels are the best environmentally friendly alternative to recharging your powerful marine battery with the engine. They are fairly simple to install yourself and not as hard as many people make out. The best boat solar panel is the Renogy 200 Watt 12 Volt Monocrystalline that comes as a complete kit with a wanderer for expanded the system up to 400 watts. Solar panels are becoming increasingly popular worldwide as a method of keeping your battery topped up. Prices have dropped a lot over the last few years and the variation in sizes means even the smaller boats have solar panels to choose from. Determining what kind of solar panel you should fit to your boat is dependent upon a range of factors. Types of technologies include Polycrystalline, Monocrystalline, Amorphous and more. Adding a solar panel to your boat is an excellent source of energy and considering that a boat is rarely in shade, it will be able to get large quantities of sun. Of course, if you are in a cold and wet country, it will not be as efficient to those in sunny locations. Once you have figured out the space you have available and your energy requirement, you are ready to find one. Below is a list of the best boat solar panels that will recharge your marine battery. The Renogy boat solar panel starter kit is designed for the newcomers of the solar panel world. It comes with all the tools and hardware required to set it up, two 100W 12V Monocrystalline solar panels, one 30A PWM wanderer charge controller, one 20ft 10AWG MC4 adapter kit and more. The wanderer is an advanced negative ground controller that protects against overcharging, overloading, short circuits and reverse polarity. It uses a 4 stage PWM charging that also prevents over or under charging of your battery. You will notice that it has LED’s that indicate the status of the charge controller. Renogy offer a range of different styles, sizes and performance solar panels that can be used with anything from RVs to boats. The Renogy Monocrystalline Starter Kit is the best boat solar panel package you can buy and will fully charge a 50Ah battery from 50% in a hour and a half or 1000Wh per day. The Suaoki uses SunPower solar cell technology to output 100W of power. It is a flexible construction that is only 0.1 inches thick and weighs just 4.85 LBS, which means it can be used on a range of boats. The brand SunPower are leading the way in terms of solar panel performance and the cells are known for produces almost 25% more solar efficiency. The marine solar panel itself is fully water resistant and semi flexible. However, you will not want to flex it further than 30 degrees as it will be at risk of breaking. Flexibility is the unique selling point of the Suaoki unit and it is the best flexible marine solar panel that offers excellent performance and value for money. The HQST is a 100 Watt 12 Volt solar panel that can produce up to 500Wh per day in order to keep the battery topped up with charge. It is a well built marine solar panel that comes with a 5 year material and workmanship warranty and a 25 year power output warranty. To make installation easier, there are pre-drilled holes at the back of the solar panel and it is compatible with a range of mounting systems. The frame is constructed of aluminium that has been treated so that it is corrosion resistant and perfect for outdoor use. Overall, the HQST is the main competitor to the Renogy and its a great all rounder for anyone looking for a high quality marine solar panel. Newpowa produce a range of solar panels for boats, RV’s and home with this unit being the most popular. It has a maximum power of 100 watts and comes with a 25 year transferable power output warranty. The cells within this marine solar panel are high performance and encapsulated in EVA. The panels are also framed using heavy duty anodized aluminum frames for additional rigidity. Overall, the Newpowa boat solar panel produces high wattage at a much lower price compared to the more expensive Renogy alternative. It is the best cheap marine solar panel that will easily keep your battery topped up with power. Many boat owners will find that their batteries tend to die when not used maintained. For the simple purpose of maintaining a boat battery, the ECO-WORTHY produces a small 10 watts of power but this is just enough the keep the battery topped up. It is completely portable and easy to install as it comes with alligator clip connectors and cigarette lighter adapters. Although it is cheap to buy, it has premium qualities such as blocking diodes that prevent the current draining back from the battery. The ECO-WORTHY is the best portable marine solar panel and is great for using as a trickle charger without the need of an expensive device. Installing a solar panel to your boat will see a number of benefits. Of course, there is an upfront cost but the amount of money that you will continue to save over the years will outweigh the initial cost and result in an excellent ROI (Return of Investment). The cost of solar panels has reduces massively over the years and now is the best time to buy them. They are not going to get cheaper than they are now and the top rated marine solar panels above are some of the best available to date. As with any marine product, there will always be some factors that you need to consider as mentioned below. In technical terms, there are three main types that include Amorphous, Polycrystalline and Monocrystalline. The Amorphous solar panels are constructed of depositing silicon onto a substrate and is used by many flexible solar panels. They do require a large amount of surface area to produce power, which can be expensive but they do respond well to low light levels. Polycrystalline solar panels use small silicon pieces that are fused together and look like small metal flakes. They work great within obstructed light and semi flexible panels can be made for boat hull curves and other uses. Finally, the Monocrystalline solar panels use large silicon pieces for each cell and it is usually the cheapest option in terms of solar panels. Deciding whether you want a flexible unit so that it can be laid upon the boat on a curve or the standard solid frame is a common dilemma. To help you out, the main benefit of the standard solar panel is that it can withstand stronger wind and rain weather conditions and is more heavy duty in general. 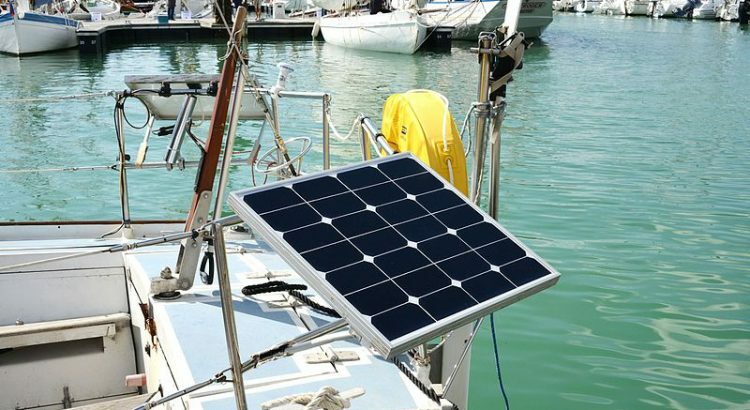 The flexible solar panel can usually be bent up to 30 degrees and mounted upon a curved surface on the boat. They are much lighter and can be easily moved around the boat to different lighting locations. However, it won’t be as heavy duty and require monitoring in bad weather conditions. Adding solar power to your boat is an excellent investment and if you are always out in the hot sunny weather, you can really achieve reliable green power. The recommended marine solar panels above are all excellent examples and just shows how the prices have reduced over the years. Of course, you don’t just need to stick with the one solar panel, you have the option to add multiple dependent upon the room on the boat. Renogy are leading the way with the best marine solar panel brand with a range of sizes and power options available. very helpful. Can one use 24volt Kyocera panels?